Fair warning: this is where I start to geek-out. The rabbit hole that Pinot Noir lives in is deep, like super deep. It is amazingly complex when done well. On the flip side it is amazingly mediocre when done poorly. Similar to the glut of Merlot in the late 90s and early 2000s that created the "Sideways Effect," Pinot Noir has quickly grown in popularity. That overarching wine trend has resulted in A LOT of below average Pinot Noir. To keep that from happening I looked to be as picky as possible with the fruit, fermentation and aging. For the fruit portion I worked with an awesome vineyard in Bennett Valley (just outside Santa Rosa). From that vineyard I nailed down two clones of Pinot, 115 and 667, to use. For the fermentation those two clones were kept separated and closely regulated to create two distinct lots. For aging, a combination of new and used oak was utilized to created a couple more lots for blending purposes. Now that bottling is here all of that has been tasted and blended appropriately to create a single complete wine. 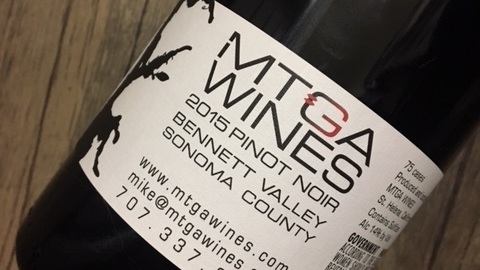 Stylistically the 2015 Pinot Noir is bright but earthy. Fruity but structured. Complex but approachable. It is exactly what I want Pinot Noir to be: a wine that is easy to enjoy but hard to understand. And that is the tip of the iceberg. The less geeky version is that I love Pinot Noir. From a very young age Pinot was a part of life thanks to my parents and grandparents. To be able to put my mark on this varietal is amazing. It is a feeling that I have a hard time describing. The closest I can come is saying, "it is a dream come true."